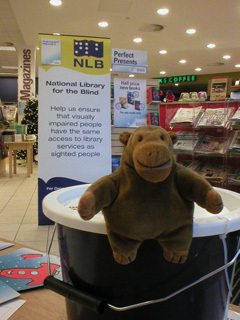 Early in December, Mr Monkey found out that the National Library for the Blind wanted volunteers to wrap books. In a flash, Mr Monkey volunteered his humans for the task. Mr Monkey got up early on Saturday morning and took the train into Manchester. After a tram ride and a short walk, he scampered in to the Borders store on Cheetham Hill Road. 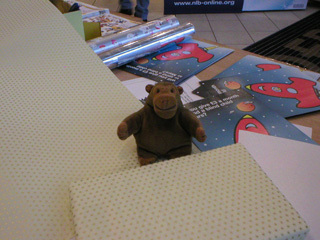 His humans and some other volunteers sat behind a table covered in wrapping paper, while Mr Monkey sat atop a collection bucket. 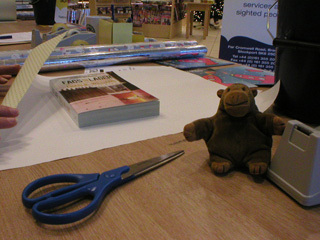 By a cruel twist of fate, the scissors were too big for Mr Monkey to use, so, when people came up to the table to have their books wrapped, he volunteered to administer the wrapping. Sometimes he helped by cutting sellotape off the dispenser, but mostly he didn't. After a book had been wrapped, Mr Monkey pushed it toward its new owner, and thanked them for their donation to the Library. The National Library for the Blind believe that visually impaired people should have the same access to books and information as sighted people and provide a range of exciting, innovative services to meet this need. Read more about them - and give a donation - at the National Library for the Blind website.